Audi, who is on its third R&D chief in 16 months, has backtracked on an earlier decision to cancel production of the R8 etron, and will now push ahead with small-scale production of the zero-emission two-seater as part of a number of sweeping changes made to its research and engineering operations since the arrival in June of its new head, Ulrich Hackenberg. Citing recent advances in lithium-ion battery technology that has reportedly increased its range from an original 215km (134 miles) to close to 400km (248.5 miles), insiders at Audi’s headquarters in Germany suggest the R8 etron will now go into limited production during the latter half of 2014. The rear-wheel-drive R8 etron, cancelled in May by Wolfgang Dürheimer who is rumoured to have been fired over that decision, is set to act as a halo model for a number of smaller and more affordable new electric-powered Audi models, whose engineering is being overseen by Hackenberg – the man responsible for parent company Volkswagen’s new e-Up and e-Golf, among other hybrid-powered models, including the XL1 and Golf Plug-In Hybrid. Among the changes made to the R8 etron to enhance its suitability for production is a new lithium battery technology featuring an alternative chemical process and, it is claimed, greater energy density than the original 48.6kWh unit. 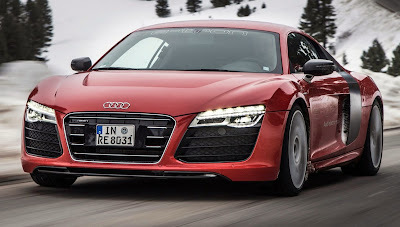 Further details remain unclear, although the new car is expected to share the styling of the second-generation R8 – itself due to be launched with conventional petrol engines in 2014. The R8 etron was conceived from the outset around the second-generation R8’s new aluminium and carbonfibre body structure in a move that saw prototypes possess a kerb weight of 1780kg.